The Inter-Orthodox Council, with a token number of bishops from each of the fourteen Local Churches and supposed to take place in May 2016 to discuss administrative issues, is looking increasingly troubled. First, there is the schism between the Patriarchates of Jerusalem and Antioch. Then there were rumours after contacts with top US officials that the US State Department was trying to set the agenda, specifically regarding homosexuality. Then there was news from the Russian Orthodox Church that delegates from several Local Churches, notably the Russian, the Romanian (the second biggest) and the Georgian, had failed to agree on the contents of several points in the seemingly US-determined agenda. Hierarchs of the Ukrainian Orthodox Church then expressed popular concern that the Council was taking place at all. After all Constantinople had not long before sent schismatic representatives of the Ukrainian Church in Canada (the fraction under Constantinople) to Kiev for reasons which the Ukrainian Church naturally found sinister. After this came the news that the elderly Patriarch Bartholomew had erected a statue to himself and that he would never recognize the Carpatho-Russian Metr Rostislav as the representative of the Church of the Czech Lands and Slovakia. Then came the Patriarch’s visit to Bulgaria when he insulted the Bulgarian people and a diplomatic incident followed and the Bulgarian Prime Minister refused to meet the Patriarch. 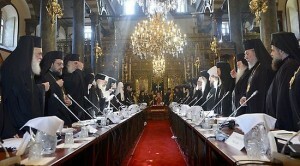 Some even asked if Patriarch Bartholomew’s behaviour was designed to sabotage his own Council. After this the Synod in Constantinople sacked the hierarch appointed only two years before for the modernist Paris Jurisdiction, Archbishop Job. Next came the shooting down by Turkey – some say at US instigation – of a Russian aeroplane. The result of this is that the Russian delegation felt unable to attend the next preparatory meeting in Istanbul for the future Council. Indeed, the question was asked if the Council could even take place in Istanbul, as had been proposed. 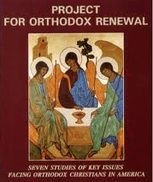 Some have suggested, as we suggested in our booklet, ‘The World Council of Orthodoxy’ in May 2007, that any future Council take place at the New Jerusalem Monastery outside Moscow, where alone a politically free Council could take place. Next came the Pope’s welcome for the Council – in effect compromising it, making it appear just to be a cheap copy of the Vatican’s disastrously divisive and US-Protestant-style Second Council of 50 years ago. Then came the Pope’s greeting to Patriarch Bartholomew on the Catholic St Andrew’s Day, looking forward to the day when Catholics, without repentance, would be in full communion with Constantinople. Then came the news that a joint commission of the Russian and Bulgarian Churches had agreed that there were no objections to the canonization of the much revered Archbishop Seraphim (Sobolev), the archbishop in Sofia of the Russian Orthodox Church Outside Russia who was the hero of the Moscow Council of 1948, which denounced ecumenism. Now news has come that Archbishop Jerome of Athens, the head of the Church of Greece, will not attend the next preparatory meeting in Istanbul. 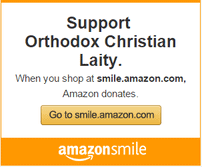 There is speculation that this is connected with the imperialistic and meddling claims of Patriarch Bartholomew to Greek territory. And also the news that Rome and Constantinople are celebrating (!) the 50th anniversary of the highly controversial (and some would say meaningless) lifting of the 1054 anathemas between Rome and Constantinople does not help. As Patriarch Alexis I of Moscow pointed out at the time this event has no importance whatsoever for the mass of the Orthodox Church as a whole, since it is an event that concerns only the tiny Local Church of Constantinople and Roman Catholicism. Even so the event was rejected at the time and is still today rejected by the devout and politically free of the Patriarchate of Constantinople. It can be concluded without hesitation that the Patriarchate of Constantinople is looking increasingly isolated from mainstream of the Orthodox Church and its Council project, at least in its old form, is looking increasingly in doubt. As has been said throughout Christian history: man proposes, but God disposes. What a cheap and distasteful piece of Muscovite propaganda. The Church should anathematize Muscovism, depose the Patriarch of Moscow, and demote Moscow to last in the Dyptych.